Helping spread the pro-life message has never been easier as the Texas Choose Life specialty license plate is now available to order online and at each county vehicle registration site around the state. The plates are $30 annually, with $22 of the $30 going to qualified organizations that provide counseling and material assistance to pregnant women considering placing their unborn children for adoption, including pregnancy resource centers. Liberty Institute helped lead the coalition of pro-life and pro-family organizations at the Texas Capitol that have pushed for several sessions to create the Choose Life plates and was thrilled to see the Choose Life bill finally pass this most recent Texas Legislative session earlier this year. Thanks again to Senator John Carona and Representative Larry Phillips for championing such important legislation in 2011! Be sure to let us know if you order one! 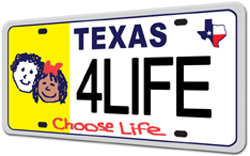 For more details and to order the Choose Life plates, visit the Texas DMV website. While the 82nd Texas Legislative session has ended, our work at the Texas Capitol has not. Over the coming days, we will be providing recaps of the main issues and votes from throughout the session. Our first video is a recap of the major issues from the legislative session. Check back on the blog frequently as we will be providing more detailed summaries of the session including links to important votes and a series of exclusive interviews from some of the influential legislators from the session. The Texas Legislature adjourned sine die the special session, and presumably concludes its official legislative work for the 82nd Texas Legislative Session. Highlights of the session include passage of (1) the Sonogram bill, (2) Voter I.D. bill, (3) Choose Life license plate bill; (4) the defunding of millions of taxpayer dollars from Planned Parenthood; (5) the protection of the elected State Board of Education, (6) the protection of citizens whose constitutional rights have been violated, (7) the defeat of attacks on marriage and efforts to expand gambling, and (8) the balancing of the 2012-2013 budget without raising taxes or using the rainy day fund. “While some religious liberty and conservative legislation did not pass, we are proud that Texas showed it stands for protecting women, protecting of innocent human life and taxpayer dollars and protecting the elected State Board of Education that has so valiantly defended teaching about our religious heritage, our U.S. Constitution and American exceptionalism. “We are so thankful that Texas has distinguished itself from Washington, and Texas leaders have shown the rest of the country how to pass a balanced budget without raising taxes. Liberty Institute is a nonprofit legal and policy group dedicated to protecting freedoms and strengthening families. Liberty Institute maintains a full-time office in Austin, two blocks from the Texas Capitol and has a daily presence at the Capitol to advocate and assist in the legislative process. Visit www.libertyinstitute.org for more information. View the full statement in pdf form here. Editor’s Note: Jonathan Saenz, director of Legislative Affairs for Liberty Institute, can help round out your coverage of the Texas 82nd Legislative Session. Call Jennifer Grisham to schedule an interview. If you like the work Liberty Institute is involved in, please support us by making a donation today. We are a nonprofit organization. The 82nd Texas Legislative Session ended yesterday. Victories include the Sonogram bill, the Choose Life license plate bill, a conservative balanced budget (that didn’t raise taxes, doesn’t use the rainy day fund), and Voter I.D. And quickly thereafter, it was announced that the first called Special Session begins today. Click here to see what bills have been filed in the House and the Senate for the special session. We’ll continue our work on conservative social and fiscal issues during the special session as well. Two items we’ll be covering for sure are budget issues related to defunding Planned Parenthood, no use of the rainy day fund and no new taxes, and education policy that respects the authority of the State Board of Education. Important updates as we move toward the final days of the Texas Legislative Session. Highlights include an update on the Sonogram Bill and other Pro-Life Legislation. Today, Governor Perry signed the Choose Life License Plate Bill into law. The law creates a specialty license plate with the message “Choose Life” with the profits from selling the plate going to support abortion alternatives. Special thanks to all the members that supported this bill, including Representative Larry Phillips (pictured above) and Senator John Carona who carried the bill in the House and Senate respectively. Update: Passed, 94-29. Great Job Rep. Larry Phillips! And Senator John Carona. 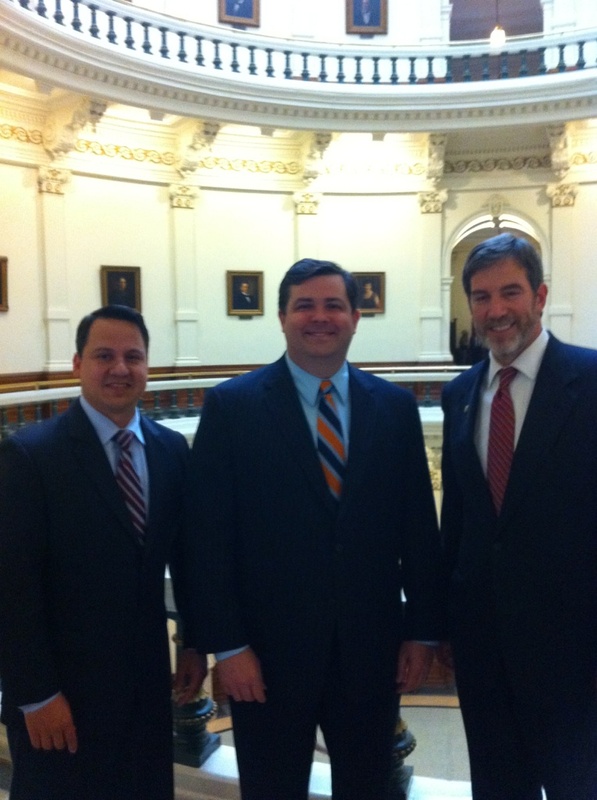 HB 238, SB 257, Choose Life license plate bill up for vote and debate in Texas House. Numerous amendments being attempted by Democrats. They are being voted down.